The stockbroking firm says a precautionary aid programme will encourage investors to lend to us without EU-IMF support. 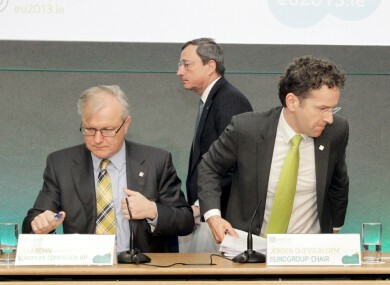 Ireland could be speaking to Olli Rehn, Mario Draghi and Jeroen Dijsselbloem quite a bit this year. ONE OF IRELAND’S largest stockbroking firms has called on the government to apply for a precautionary second bailout programme – believing it could help Ireland to escape from its first one. An economic report from Goodbody Stockbrokers (PDF) includes a recommendation that Ireland should set up a back-up fund as an “added safety net” to escape the bailout when the funds from the original EU-IMF package run out this year. “The recent rejection of the pay deal with public sector workers as a reminder of the banana skins that still exist in reducing budget deficits to sustainable levels,” the report says. It points out that applying for a secondary bailout, which would come with its own hypothetical terms and conditions, would make Ireland eligible for the European Central Bank’s new OMT programme – where it could buy Irish bonds second-hand to force down the cost of borrowing. The report also affirms that Ireland should continue its plans to make €5.1 billion in Budget adjustments over the next two years. Goodbody chief economist Dermot O’Leary said it was “critical now that we manage our exit from the bailout in an appropriately prudent manner” if Ireland was to become the first country to successfully exit an EU-IMF bailout programme. “There are a number of both domestic and international variables which could impact a successful exit and we need to have appropriate protection to ensure a fully successful transition to a full market return,” he added. The calls come as an inspection team from the EU and IMF begins their tenth quarterly inspection of Ireland’s bailout progress, in a two-week visit which is likely to focus closely on how Ireland can ensure a smooth exit from the bailout and a return to independent financing. Email “Goodbody: Ireland should have second bailout ready to help exit from first”. Feedback on “Goodbody: Ireland should have second bailout ready to help exit from first”.